(AINA) -- The persecution and discrimination against the Christian Copts in Egypt takes many forms; the most obvious manifestation is limiting their freedom to practice their religious rites, sometimes through violent means. Many believe such acts of violence takes place due to the Egyptian Government's attitude of failing to apply deterrent laws on assailants on one hand, and the increase in 'Muslim mob justice' of taking the law in their own hands without fear of retributive justice, on the other. The most recent in this series of violent assaults took place in the Upper Egyptian village of Ezbet Boushra-East, on 6/21/09 when Copts were assaulted, their homes destroyed and their crops uprooted by a Muslim mob and the Egyptian State Security, 'on suspicion' that a holy mass was being secretly celebrated at a priest's home (AINA 6-22-2009). 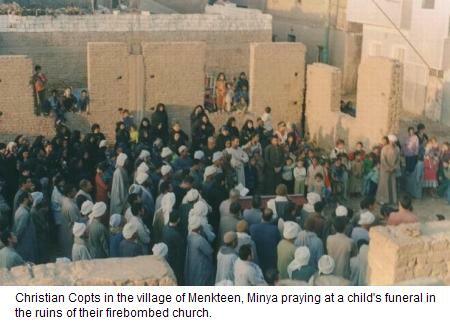 With every violent attack on Copts, the same scenario of events takes place. The State Security forces the Coptic victims to an unofficial 'reconciliation meeting', in which they are forced to give up their rights, and the perpetrators go unpunished. Such a 'reconciliation meeting' for the villagers of Ezbet Boushra-East is scheduled for 6/30/09; the outcome of this meeting is already known by the Copts. On June 26, 2009 the U.S. Commission on International Religious Freedom (USCIRF) expressed its concern regarding this attack and called on the Egyptian Government to protect the Copts and their property. "This latest incident is another example of the upsurge of violence against Coptic Christians we have seen in the past few years," said Felice D. Gaer, chair of the Commission. "The Commission has long expressed concern that the Egyptian government does not do enough to protect Christians and their property in Egypt, nor does the government adequately bring perpetrators of such violence to justice." Condemning the latest attacks, Dr. Selim Naguib, President of the Canadian Coptic Association said on 6/29/09 "The Sectarian agenda for 2008 is full of bloody events, and barbaric attacks against the Copts. More than 70 cases of violations of the rights of the Copts took place only during that year. Not one week passes without hearing of attacks on the Copts." Violations ranged from attacks on churches and monasteries such as that of the Virgin Mary in Dronka and Abu Fana in Qasr Hur, Minya last June to those on congregations. "Even those praying within their homes are assaulted. Copts are prevented from praying and from building churches, so as not to 'hurt the feelings and sentiments of Muslims.'" "These crimes which have been perpetrated since the early seventies to the present day, are planned with the objective of the 'Islamization of Coptic families', by terrorizing them into enforced displacement and the breaking down of Coptic families," according to Dr. Selim. The assault on the Coptic villagers of Ezbet Boushra-East is the latest incident in a long series that goes back to the seventies, when on November 6, 1972, the Holy Bible Publishing House in Al-Khanka, on the outskirts of Cairo, was burnt down and its contents looted, followed by attacks on Coptic homes, because Copts in that area used it to celebrate Holy Mass without a license. Since that incident, the Copts have been at the receiving end of attacks that number in the hundreds and vary in magnitude from minor harassments to major assaults. A video called 'Copts Under Siege' is published in English by Free Copts, giving interviews with Coptic victims of sectarian attacks on churches (part 1, part 2). A vivid example of the Government's deliberate refrain from granting churches restoring permits is that of the village of Menkteen, Minya. The villagers had their church burnt down in 1977 before completion, in addition to the looting of their properties and shops by Muslims. They have been waiting for 28 years for a permit to complete the building of their only church. The photo shows the villagers recently praying at a child's funeral in the church ruins. Many Coptic NGOs share the same belief with the USCIRF that the problems of violent attacks on Copts might be solved if the Egyptian Government would finally pass the long awaited bill on the "unified law for building places of worship," which would put an end to all problems related to building and restoring places of worship. "If the Egyptian government would pass and implement such a law, it may help in stemming some of the violence targeting Christians who are forced to convert private homes and buildings into churches because they cannot get permission to build an appropriate place of worship," recommends the USCIRF report. The upsurge in violence against the religious liberties of the Copts has been encouraged by the Islamization process of the country by the late President Sadat and the support he gave to Islamic fundamentalists. He declared in 1970 "I am a Muslim president of a Muslim state," changing the constitution to make Islamic law (Shari'a) Egypt's main source of legislation. This step has relegated the Copts to the status of second class citizens. A study published this month by the Evangelical Fellowship of Canada found that discrimination against Christians is entrenched in Egyptian laws, particularly in the nation's constitution. Another contributing factor was the general discrimination and prejudice which is prevalent in the minds of the population at large. Underlying both of these problems is the spread of the militant Islamist mentality in Egypt. "With every Parliamentary session the Government does not even bring up for discussion the bill on the 'unified law for building places of worship,'" said Dr. Naguib Gibrael, President of the "Egyptian Union" Organization for Human Rights, "instead the state busies itself with laws such as traffic law, environment law and bird flu law." The question which Copts ask is how long they can hold on to their Christian faith when faced with a government that does not wish to find a solution to their dilemma.